One of our great pleasures is meeting innovative school leaders and learning about the amazing things they have done. One such leader is Dr. Ann Debreaux-Davis from Southeast Halifax High School in North Carolina. Southeast Halifax is a rural school with a high level of poverty. In recent years, it has been plagued by gang violence, with two gangs fighting for turf. The problem had gotten so bad that Dr. Davis’ predecessor had installed metal detectors and arranged for two bus drop-offs – on for each gang. The prevailing philosophy had been control, for if we control their day, we can focus their time on learning. Dr. Davis realized that she had to change the paradigm if she wanted to change the outcomes for kids. Most important to her plan was that she had to walk the walk. As anyone who has worked in high poverty schools knows, these kids are going to be reluctant to believe your words. A large percentage of these students have learned to distrust adults and expect them to leave quickly. She knew that she had to prove to the kids that she was there for them and that she meant what she said. Telling them “school matters” wasn’t going to work. She had to show them that this school was different, that this was their school. Her solution included finding ways and structures for listening to the students. “What do you need?” and “what do you want?” became mantras. Students were invited into authentic decision-making roles, and their ideas were listened to and respected. Dr. Davis says she “never says no” to an idea, but will tell students that they’re going to “shelve it for now.” Students know this means an idea needs more research or more discussion. Importantly, she has established systems to engage with students as community building partners. She’s created a proposal framework and expects students to use it. Students book appointments to discuss ideas, and she takes that time seriously. Student feedback helps guide policy. This is evident in the school’s annual goals for test achievement, which the students help set. The students also participate in choosing rewards for meeting the goals. The result is that students become each other’s cheerleaders and study partners. The results have been nothing short of phenomenal. Not only has the school been able to get rid of the metal detectors and stop sequestering students, test scores are on the rise. State math results have increased by almost 50% in 3 years. At the same time, chronic absenteeism had plummeted to 7% by 2014. Dr. Davis is the first to say that they haven’t reached their goals yet, but the progress has been amazing and the cultural transformation is inspirational. In most instances, leadership takes it upon itself to determine what students need. Typical responses to schools with discipline and achievement problems is to seize more control. Into this environment came a leader who took less control. She asked the students what they wanted and respected their answers. She gave them authentic opportunities for leadership and let them make meaningful, impactful decisions. Voluntary: Students are incredibly diverse in their backgrounds, hopes, abilities, family situations and beliefs – more so now than ever before. One size fits all models of education are increasingly obsolete. Low performing students in particular will only engage to the degree to which they are comfortable. For this reason, inviting students into the educational process will increase the likelihood of participation. Powerful and profound initiatives will allow for all students to get what they need on their own terms. Not “School-Like”: Research shows that by the time a student is in 3rdgrade, he or she has already self-identified as someone who is a “winner” or a “loser” in educational settings. By the time students are in middle school, they can tell by the first day of school whether they are going to be successful in a particular class. To help our students, particularly those with a track record of limited success, we have to change the way school looks, feels and behaves. Relevant: When teachers are asked about the importance of the material they are teaching, the most common answer involves the future – students will need the knowledge and skills for a future class or their career. Brain research tells us that students are not capable of thinking that long-term. Material we want them to learn needs to be more immediately relevant and contextualized to their lives. Flexible: Nearly every teacher I know has, at one time or another, complained about the prior knowledge (or lack thereof) of the students they are getting. “How can I teach them, if they haven’t mastered the basics?” I am asked this quite frequently. The answer lies in flexibility. School models must allow for students of all levels to engage with the curriculum from their personal point of access. We must make room for all students, even those who are several grade levels above or below our expectations. By changing classroom dynamics (not performance expectations), we can allow more students to engage with material in meaningful and transformative ways. Engaging: Increasingly, school has to compete with video games, social media and other forms of multi-sensory entertainment. Teaching is, in part, a performance. We must learn to embrace the technological tools that are available to us. If we do not engage with students, they will just tune us out. Set your table: Make sure you’ve invited the right people to help you plan. Make sure to include some people you wouldn’t ordinarily invite, such as recalcitrant staff and hard-to-manage students. Get multiple perspectives and really listen to diverse ideas, even if they sound incorrect or even crazy. School turn-arounds only work when they appeal to the disenfranchised, so you need their input most of all. Ensure your focus is right: Use rigorous data protocols to ensure that the problem you solve is one you actually have or is the one that’s your most acute problem. Too often schools end up addressing minor issues or the wrong aspect of a problem instead of the heart of their major issues. Confirm your solution: Before you move forward with a plan, talk about it. Talk about it a lot. Talk to students about it. Talk to parents. Talk to teachers. Make sure that people know what’s happening and why. Most importantly, listen to their concerns. Maybe you’ve left something out of your plan. Maybe people’s concerns haven’t been addressed. Deal with problems before they sink your initiative. In most schools across the country, there’s an annual ritual around test scores. When the scores are released, the leadership cautiously opens the file and learns if they’re Good, Bad, or Mediocre. In the vast majority of the schools, when the news is not good they engage in the second phase of the ritual: Staring at Numbers. Tasked with explaining the results, the leadership spends some time trying to figure out “what the data says,” so they know what areas to work on. The following example is from one such school. This North Carolina middle school was disappointed to see a “D” on their report card. The silver lining was that they sat on the cusp of a “C.” As a school that served a large number of high needs kids, math scores were historically low, and 2016 was no exception. The leadership decided they needed to dedicate some time to really understanding why they weren’t reaching their goals. They assumed the issue was that the high needs students needed more intervention and remediation. But first they wanted to know which kids and in what areas. So they began digging in. On first glance, the “subgroup” populations are underperforming – particularly Special Education and Limited English Proficient. The logical conclusion for leadership was to look at those programs. What inclusion and pull-out services were being offered? How well-aligned was the supplemental curriculum? This seems like a natural place to start. Except it was completely wrong. When we look at the results against the state results (controlled for grade level) we see that the school is actually outperforming the State in both Special Education and LEP. Where the school is the lowest is in the aggregate population. Clearly this school’s problems in mathematics are not an issue with services being offered, but an issue with the core programming being offered for all students. If they had tried to address the issue of “special” programming, this school would have been putting resources into solving the wrong problem – one that would have seen lower return on investment. But let’s dive a little deeper. If the problem is the core mathematics programming, the first place they should look is the curriculum. Looking at the school’s achievement and alignment with state priorities paints a telling picture. It certainly appears that they’re not spending enough time on Numeracy, as it represents over 50% of the test, but they’re only spending 33% of their time on it. The results seem to reflect that problem, as their Numeracy results are the lowest of all the subtopics. However, looking at state results, again, paints a different picture. This shows clearly that the school is actually outperforming the State in Numeracy, and that the greatest opportunity for gain is in Geometry, an area where the school spends a lot of time. Again, we see that addressing the problem we first identify can lead to the wrong conclusion. This could result in an expensive, unneeded and ineffective curricular reform. We also have yet to determine that the issue is, indeed, curricular in nature. Perhaps the issue is with pedagogy. This same analysis, broken out by teacher can be telling (names have been changed). This graph highlights the differences between classrooms in the school. While one year of data is not enough to draw conclusions, the 3-year pattern was rather consistent. We can see that Mrs. Castro is head and shoulders above the other teachers in teaching Numeracy, but lacking in Geometry, whereas Mr. Baker’s students tend to perform better than others in that area. Ultimately, the school’s decision was to form Professional Learning Communities, by grade level, and to inform them with data coaching. The data was used, not to evaluate any teachers, but to point out areas of strength and need so best practices could be shared. The result was grass-roots efforts to improve instruction, more team-teaching, greater standardization and higher achievement for all students. We’re going to preach a little school data heresy here: never, never, never look at data first! True data-informed leadership asks powerful questions and debates the ways to answer them. Raw data doesn’t tell a story, it provides information to illuminate the story you are telling. It is a resource that can be used to answer questions, but only once the questions have been articulated! Avoid the bad analysis trap by spending the time to build clear, specific questions focused on your students and your school. If you don’t do this work, you will get distracted by easy answers and possibly come to the wrong conclusion. It can be more than a waste of time, it can lead you to double-down on the wrong strategy. Instead, focus your data teams around cycles of inquiry. By using better data team protocols, leaders can avoid “chasing squirrels” and focus limited time and resources on high-impact issues and solutions. Does your imaginary school look anything like this? When asked to describe a school, people will typically talk about tile-floored classrooms with heavy wooden doors and big chalkboards at the front. Lockers. Gyms. Cafeterias. Buses. You can almost smell an evocative perfume of old sneakers, tempura paint, pencil shavings, and Lysol. “School” is more than familiar: it’s archetypal.Which is a double-edged sword. What if, instead of inspiring you to learn, that evocative smell, those rows of desks, the walls covered in brightly laminated educational posters fills you with a looming sense of dread? A study of 2000 PISA data revealed that nearly half of all US students don’t feel like they belong in their schools. Predictably, these students had significantly lower participation and achievement scores. If you’re at a low-performing district, chances are your students don’t associate “school” with “success.” To change the outcomes, you may need to rethink what “school” means for your kids. One district that we worked with noticed an increasing problem with absenteeism. Convinced that their academic programming was good, they tried lots of interventions to get students to come back to school, but found that the return on investment was minimal. The problem was complex and required rethinking the service model at a fundamental level. The district realized that it was not realistic to get many of their students to come back to school. Instead, they would have to try an alternative approach – to bring school to the students. The result of their vision is the Massachusetts Virtual Academy (MAVA), the first 100% virtual school in the state. This public, non-charter school was designed to deliver targeted instruction for students in grades K-12 who could not or would not attend a traditional, brick-and-mortar school. What the district didn’t anticipate was how popular the school would be. Soon the school was serving students from across the state who were thrilled to find a school that could meet their needs. In 2015 MAVA drew 700 students from across the state, pulling from 80 different districts. More than 33% of students have never set foot in a traditional public school before. Nearly 50% of the students are considered high needs. The results have been excellent. Despite the challenges of the model and the diversity of the student body, MAVA has been able to outperform expectations for their 2-year, 3-year and 4-year cohorts. Analysis has shown that the longer students stay with MAVA, the better their performance on end-of-year assessments. While many districts would focus on luring kids back to school, this district discovered they could best help kids with no “school” at all. Signs that say “Mr. Smith’s Classroom”? The physical layout and crowd-management techniques you use send specific messages to your students. Instead of defaulting to the familiar, ask yourself “what message do we want to send?” Then adjust your structures to reflect your values. For a little inspiration, check out these schools that have crafted their spaces around their values. High Tech High School in San Diego, modeled after DaVinci’s laboratory, was designed to encourage project-based learning and student-led learning. Spaces are laid out to optimize focus on teams and projects and to minimize frontal teaching. The Saunalahti School in Finland was built with a focus on increasing collaboration between students, staff, and their community. There are no centralized classrooms and spaces are set up so that teachers cannot lecture to the group. The large open spaces and big windows are meant to encourage community engagement. At the same time, the layout of the yards and placement of the entrances reflect an eye to safety and security. 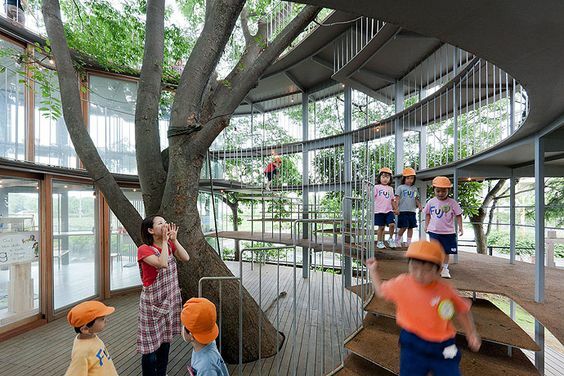 The Fuji Kindergarten in Japan is designed to engage students in nature-based and community play. Students climb trees and stage performances for classmates. The architecture, featuring a completely round building with a huge courtyard, drives the programming to play-based collaboration. In each of these schools the physical structures, and how they’re used, are designed around specific educational goals. The most successful schools around the world are ones that seek to create engaging, flexible programming that allows students multiple entry points and authentic collaboration and exploration. Low performing schools know that “if you build it, they will come” is a myth. How you build it is the key. Instead of assuming what your school should look like, focus on what you want your school to accomplish. The ends-outcomes-indicators protocol is a good way to begin. From there you may decide that your school wants to graduate students who have all completed a year-long independent research project, selected and run entirely by the student. This opens up your team to be incredibly creative, as you think through the many ways students can demonstrate their knowledge in ways that matter to them. How directive are our assignments? When are the kids practicing independent research skills? What percentage of time is spent on frontal teaching? How are we building in collaborative time for kids to bounce ideas off each other? What resources do we have to help the kids, and how can we increase their availability? Your team will begin focusing on what matters and spend less time reinforcing outdated norms. When you peel back assumptions about what you school “has” to look like and start focusing on educational success, you may find solutions you weren’t expecting. The beautiful secret of “Low-Performing Status” is that you are now free to try something totally new. You know your assumptions about how to build a great school are fatally flawed. Swimming the same channel isn’t going to work. This is your opportunity to jettison your wrong assumptions and in their place build the school you want to lead. This is your opportunity to create a radically new school, built around kids, informed by authentic inquiry and analysis, and led by you.